We’re sure you already know that using the tenets of feng shui can result in a home that hums with harmony. But while you might think of this ancient Chinese philosophy as a way to improve your indoor space, you might not realize it can be directed toward your home’s exterior, too. Ready to take the feng shui outside? 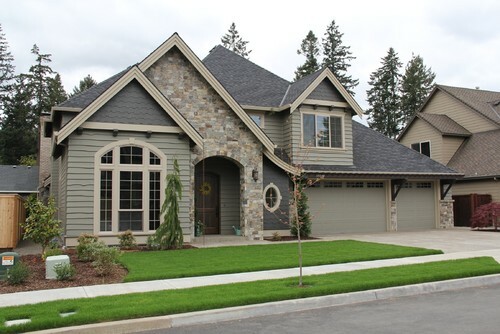 Here are seven spots to focus on when it comes to your home’s curb appeal, and the feng shui reasoning behind each one. “Feng shui dictates that a welcoming doorway calls both energy and opportunity into the home and the lives of those who live there,” says Trisha Keel, director of education at the International Feng Shui Guild. If your entrance can’t be easily found from the street, try to figure out why (you might need to get bigger house numbers or trim back some bushes). If good energy, or qi, can’t find your door, a buyer won’t either, Cho adds. 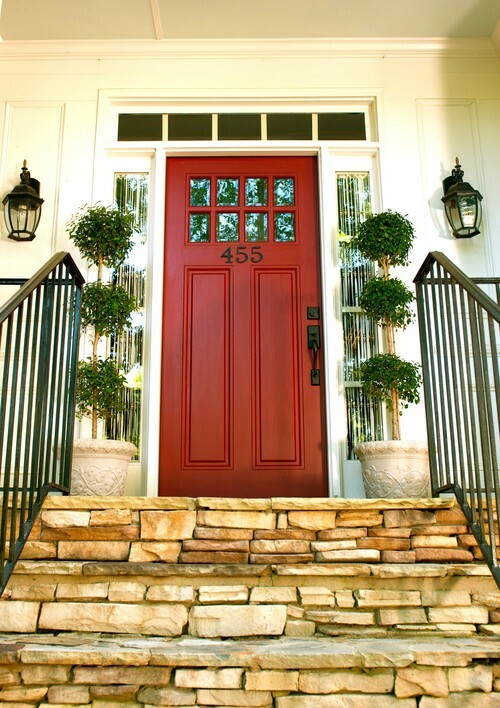 “Paint the front door red, which is an auspicious color in feng shui that attracts the eye,” Cho suggests. 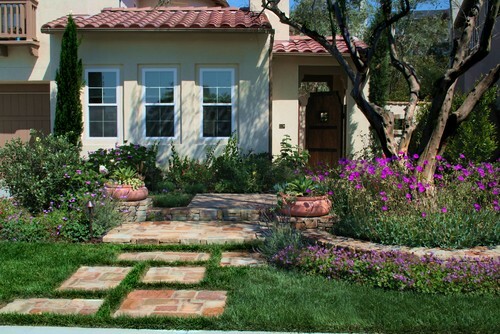 And don’t forget about the walkway or sidewalk that leads to your home, points out Katie Weber, a feng shui practitioner and creator of the Red Lotus newsletter. Both should be in good repair because, like a flowing river, they bring beneficial energy to the house. To boost your curb appeal, you probably already know some of the old tricks—like adding lush plantings, blooms, and colorful trees to your yard and front stoop. But following these tips does more than pretty things up. “Flowers are the yang [positive] expression of a plant, which indicates its health and confers it to the home,” Weber says. In fact, if you focused on feng shui only outside your home, it would be enough to raise your house’s overall energy and bring in growth and vitality, she explains. Not the season for planting where you live? Keel recommends bushes and grasses in front, with seasonal color in pots at the door. But a word of caution: Nix any kind of cactus in your planters. “Peeling paint indicates problems coming to light,” Keel says, so make sure to tackle any problem areas before an open house. Good feng shui depends on a house that’s in the best shape, so be sure to keep up with small—but significant—maintenance tasks. 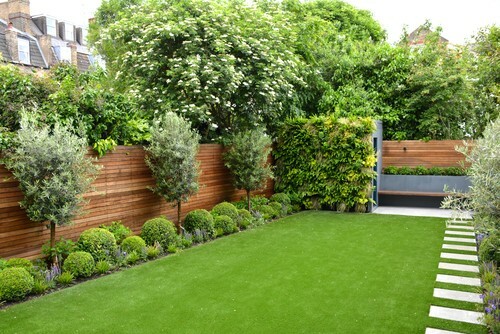 A pristine lawn that’s mown, with healthy plants and free of leaves and branches, says, “I care about my home.” But it also adheres to feng shui principles. 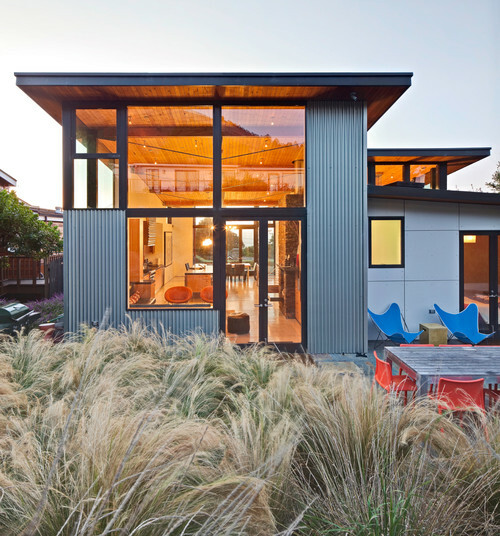 “An unkempt lawn indicates that the home does not cultivate good energy,” Cho says. 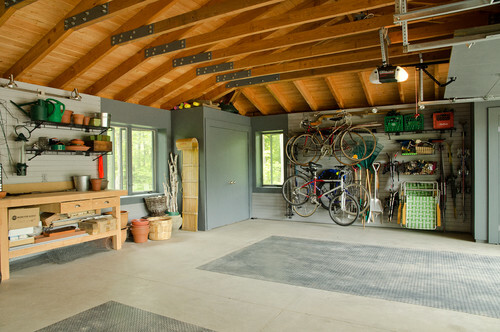 We’ve got news for you: House hunters will peek inside your garage—and traverse your driveway to get there. Clean up these hot spots before it happens. “If you have a lot of clutter or your pathways are blocked, potential buyers will feel heavy, scattered, and overwhelmed—and this is not what they want to feel in their new home,” says Kim Julen, a certified feng shui practitioner. And don’t get us started on those garbage bins haphazardly sitting in your driveway. Your refuse has negative energy (plus, it stinks). Leaving those bins out in the open can bring down your entire home’s qi, Cho says. “Garbage is only attractive to flies, so create a trash can corral and you’ll sell easier than if you just throw the bins in the garage,” Keel says. It may sound hokey, but windows are the eyes of your house—and sparkling-clean ones are critical to feng shui curb appeal. “Clean windows represent clear thinking and understanding, and dirty ones can make buyers wonder what else isn’t maintained,” Cho says. Plus: “Dirt doesn’t reflect light, and it’s light that attracts people,” Keel adds. Got a sticky door or wobbly hinges? These point to carelessness and may deter a buyer. “When things fall into disrepair, it indicates stagnant energy and it pushes life away, rather than bring it in,” Cho says. 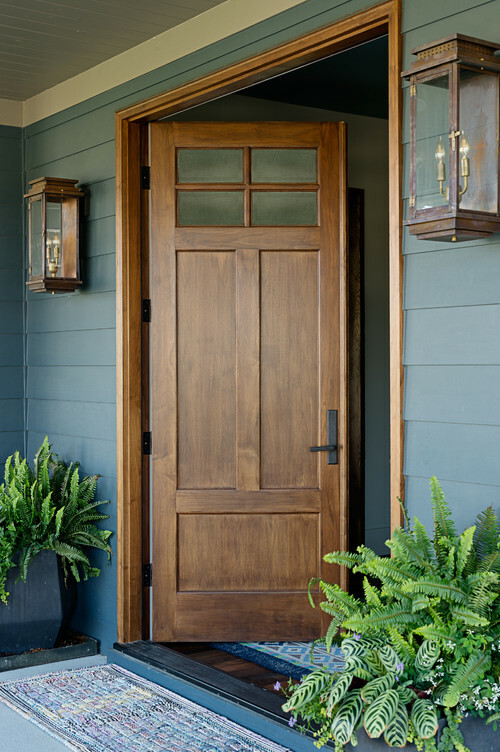 Take note of rust around your home’s exterior, too. “Rusty doorknobs point to a challenged career or difficult, untended relationships,” Keel says. A wise buyer may pick up on these vibes—and move on.